and outfits available at the lowest possible prices. the JSI exclusive: The EV-4s Companion violin outfit. We are an authorized Yamaha dealer! We carry electric instruments from today’s leading brands, including Yamaha and NS Design, so you can be assured you are getting the best quality instrument for the price. You save even more with one of the outfits we've assembled, available no where else! 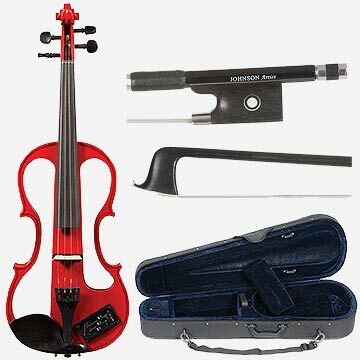 We've put together some breathtaking outfits including exceptional instruments with high-quality carbon bows and hard cases or gig bags. These outfits have built in savings and are available only at Johnson String Instrument! We have the solution for electrifying your acoustic instrument. From a temporary slip-on design to a more permanent bridge pick-up, our selection from Fishman, Headway, Realist, and others for your violin, viola, cello, and bass will let you be heard loud and clear. We carry a wide variety of bows to fit your needs. In addition to wonderful antique and modern makers we carry high-end Brazilian workshop bows. We also offer a wide selection of non-wooden bows such as carbon fiber, carbon composite, and fiberglass. See something you like? Call us to schedule an appointment or arrange a trial shipment! Brands that have been specifically designed to capture the nuances of today's electric instruments. We are well-known for our wide selection of cases in a variety of price ranges. We carry popular, high quality brands in a variety of price ranges to ensure that you find the right protection for your investment. Learn more about Yamaha's line of electric string instruments. Keep your instrument out and ready to play with a safe and secure instrument stand.